So went hiking up in the Catskills with the intention of camping with a buddy. After waking up at 5:30, and then driving 3 hours north we hit the trail a little late – 9:00ish on a chilly (50 degrees and falling) morning full of drizzle. Got a map and little advice from the Ranger Station and was onward and upward. Approximately an hour and a half into the woods my partner in this mini-adventure develops a not-so-mini 1.5 inch blister on his heel. Ouch. (Partial gear list to come as this was mostly a preparation/gear avoidable injury). 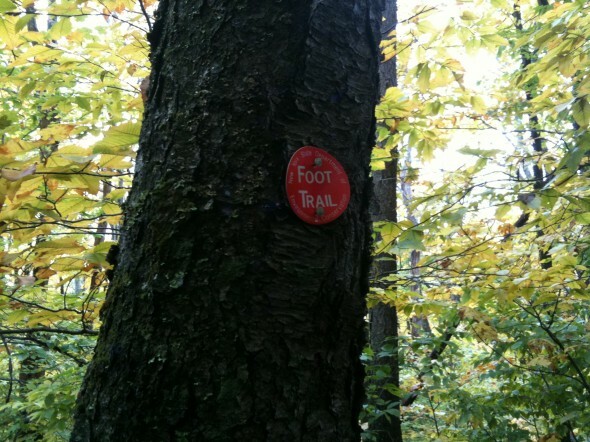 The trail, Devil’s Path is noteworthy in New York. It was featured in NY Times a couple weeks back. It’s 25 miles of some of the more difficult hiking in New York, taking in 6 peaks; small by global standards but challenging with anything more than a daypack. Post blister I knew we were ascending on borrowed time. Sure we made up another 1000 feet of vertical gain (over about a mile), but by lunch prospects were fading as fast as the temperature, now 41 degrees. With the rest of the day staring at us like Everest (some 25,000 feet higher than the Hunter Mountain we sat on) we bagged it. Yeah, without even any serious remorse. I could hear my wife laughing before making the call. And laugh she did. Coming down still took two and a half difficult hours. Another hour and and we were stopping at Ikea in New Jersey. Beyond defeated. Devil’s Path notches clear victory. Round 2? Always trying to find gear solutions that can work for many sports – sailing, hiking, scuba, occasional kayaking, etc. Itopomaps worked perfectly – a little basic on the interface side, but you can download maps for when you’re out of range of cell signal. I would say this is water resistant not waterproof – have used sailing in rain though – so far pretty good. Used sailing foul weather jacket – same effect. Good. Mil Spec MIL-PRF-31013 and ANSI Z87.1-2003+ compliant (when not used in conjunction with Rx Inserts). All CDI™ lenses provide 100% UVA/UVB protection. Bring something and hope to use none of it…. This entry was posted by John Pasmore on Sunday, October 11th, 2009 at 7:29 pm	and is filed under New York, Outdoor and tagged with app, Atlantis Weather Gear, Camping, Catskills, Devil's Path, Ess Eye Pro, Gear, Hiking, iphone, itopomaps, Marmot, Marmot Shooting Star, MSR PocketRocket, New York, North Face, Pacific Outdoor Equipment, Seal Line. You can follow any responses to this entry through the RSS 2.0 feed. God love yahoo, great blog. Thanks a bunch.